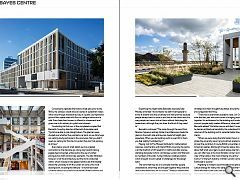 Fifteen years after it began the University of Edinburgh has completed the final phase of its Potterow development. Bennetts Associates have stuck with their original vision throughout this marathon journey but is the finished project worth the wait, or is it already dated? Photography by Keith Hunter. 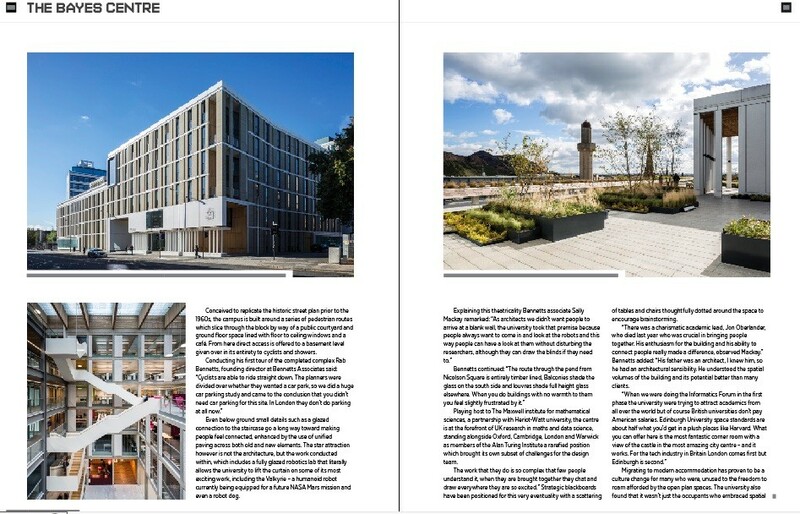 Fifteen years later and a decade after delivery of the Informatics Forum and Dugald Stewart Buildings the University of Edinburgh has completed the final phase of the Potterrow development. 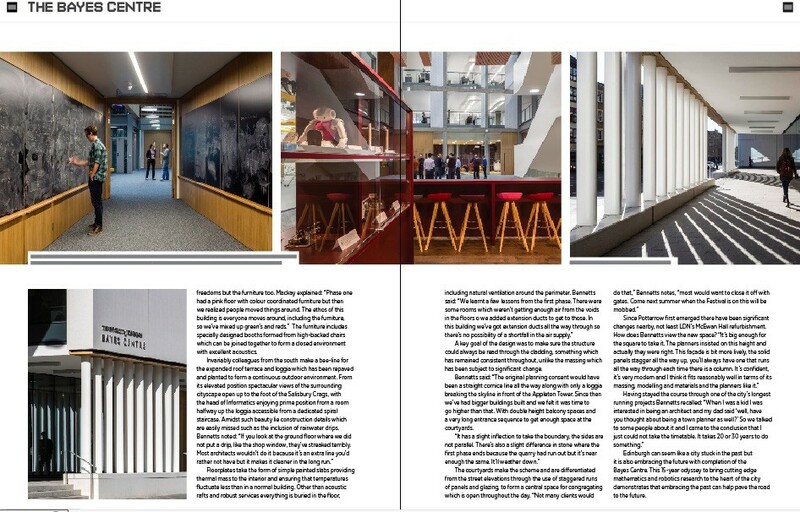 Since winning the architectural competition back in 2003 Bennetts Associates have persevered with their original vision on the marathon journey but is the finished project worth the wait, or is it already dated? Over the intervening years Edinburgh’s status as a magnet for experts in data science and artificial intelligence has grown, building towards the critical mass necessary to support the Bayes Centre, a 9,500sq/m hub which draws together 600 PhD students, researchers and university staff with established tech-oriented businesses and start-ups. 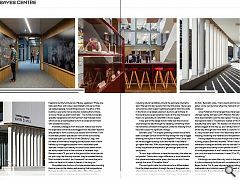 Combining a robotics lab, lecture theatres, workshops and flexible office space within one ‘synergetic’ design the finished work seeks to break down barriers between business and academia and allow ideas to percolate freely. In its most literal sense this sees the Bayes Centre push connectivity with multiple links on different levels, maximising connections in the manner of a silicon chip or neural map but the approach also extends to a public atrium and street facing ‘shop window’, designed to promote transparency between the building and wider city. 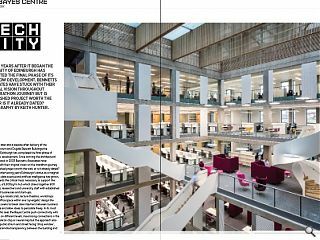 Conceived to replicate the historic street plan prior to the 1960s, the campus is built around a series of pedestrian routes which slice through the block by way of a public courtyard and ground floor space lined with floor to ceiling windows and a café. From here direct access is offered to a basement level given over in its entirety to cyclists and showers. Even below ground small details such as a glazed connection to the staircase go a long way toward making people feel connected, enhanced by the use of unified paving across both old and new elements. The star attraction however is not the architecture, but the work conducted within, which includes a fully glazed robotics lab that literally allows the university to lift the curtain on some of its most exciting work, including the Valkyrie – a humanoid robot currently being equipped for a future NASA Mars mission and even a robot dog. Playing host to The Maxwell institute for mathematical sciences, a partnership with Heriot-Watt university, the centre is at the forefront of UK research in maths and data science, standing alongside Oxford, Cambridge, London and Warwick as members of the Alan Turing Institute a rarefied position which brought its own subset of challenges for the design team. The work that they do is so complex that few people understand it, when they are brought together they chat and draw everywhere they are so excited.” Strategic blackboards have been positioned for this very eventuality with a scattering of tables and chairs thoughtfully dotted around the space to encourage brainstorming. “There was a charismatic academic lead, Jon Oberlander, who died last year who was crucial in bringing people together. His enthusiasm for the building and his ability to connect people really made a difference, observed Mackay.” Bennetts added: “His father was an architect, I knew him, so he had an architectural sensibility. He understood the spatial volumes of the building and its potential better than many clients. Migrating to modern accommodation has proven to be a culture change for many who were, unused to the freedom to roam afforded by the open plan spaces. The university also found that it wasn’t just the occupants who embraced spatial freedoms but the furniture too. Mackay explained: “Phase one had a pink floor with colour coordinated furniture but then we realized people moved things around. The ethos of this building is everyone moves around, including the furniture, so we’ve mixed up green’s and reds.” The furniture includes specially designed booths formed from high-backed chairs which can be joined together to form a closed environment with excellent acoustics. A key goal of the design was to make sure the structure could always be read through the cladding, something which has remained consistent throughout, unlike the massing which has been subject to significant change. Bennetts said: “The original planning consent would have been a straight cornice line all the way along with only a loggia breaking the skyline in front of the Appleton Tower. Since then we’ve had bigger buildings built and we felt it was time to go higher than that. With double height balcony spaces and a very long entrance sequence to get enough space at the courtyards. 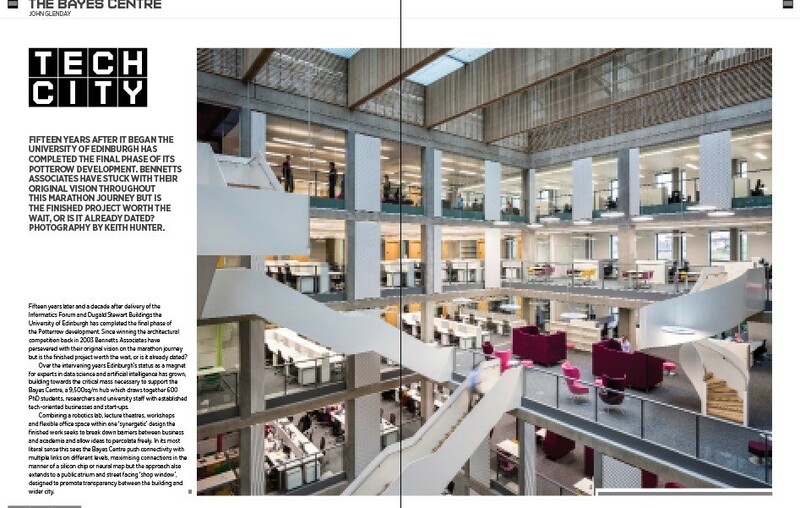 Edinburgh can seem like a city stuck in the past but it is also embracing the future with completion of the Bayes Centre. This 15-year odyssey to bring cutting edge mathematics and robotics research to the heart of the city demonstrates that embracing the past can help pave the road to the future.